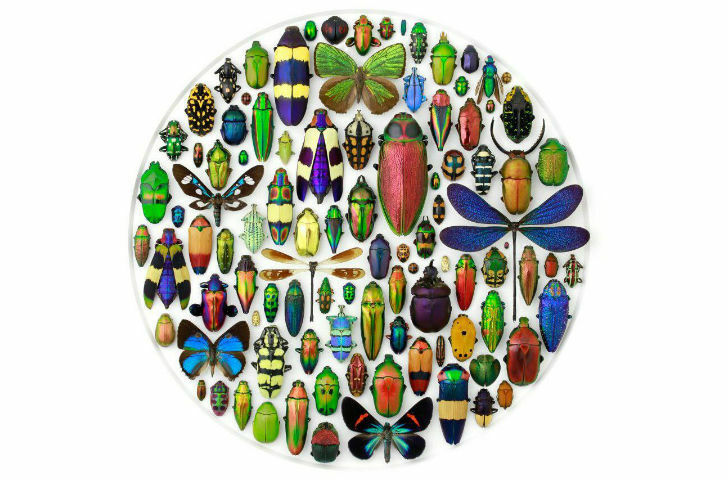 These fascinating mosaics of insects and butterflies are the works of artist/designer Christopher Marley. His obsession with insects actually began out of a fear of bugs, but eventually grew into an appreciation for their beauty. Marley creates a myriad of designs out of natural things like beetles, bugs, butterflies, moths, carnivorous plants, seashells and even fossils for his Pheromone collection. Although one might think that his collecting insects from the wild would diminish populations, his art is helping carve out a niche industry of local collectors who are dedicated to preserving their habitats. Christopher Marley is an Oregon-based artist and designer with a penchant for bugs and butterflies. A former model turned collector, Marley became obsessed with beetles after he finally got over his fear of them. Then he began collecting them to create these incredible mosaics. 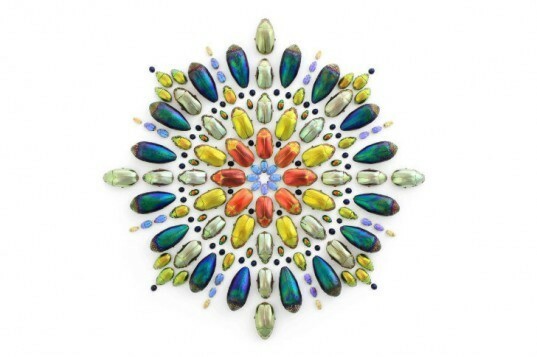 He is most known for his bug and beetle pieces, but also uses butterflies, shells, urchins, fossils, crystals and plants. Marley works with local collectors all over the world to source his material. Although you might think that his collectors are harming insect populations, these locals are carefully selecting adults and encouraging the growth of the collectors are ensuring that the larvae, eggs and pupae have a chance to grown and reproduce themselves. Indigenous families care for the land, protect it from clear cutting and help support the insect populations all while earning a sustainable income. Gorgeous works of art that support and protect critical habitats and families. Read more about Marley’s environmental ethos on his website and an interview about his work on DesignMilk. Works can be bought from his website or through a variety of retailers. Christopher Marley is an Oregon-based artist and designer with a penchant for bugs and butterflies. A former model turned collector, Marley became obsessed with beetles after he finally got over his fear of them. Then he began collecting them to create these incredible mosaics. He is most known for his bug and beetle pieces, but also uses butterflies, shells, urchins, fossils, crystals and plants. Marley works with local collectors all over the world to source his material. Although you might think that his collectors are harming insect populations, these locals are carefully selecting adults and encouraging the growth of the collectors are ensuring that the larvae, eggs and pupae have a chance to grown and reproduce themselves. Indigenous families care for the land, protect it from clear cutting and help support the insect populations all while earning a sustainable income. Gorgeous works of art that support and protect critical habitats and families. Read more about Marley's environmental ethos on his website and an interview about his work on DesignMilk.